…Machine-Age thinking: (1) decomposition of that which is to be explained, (2) explanation of the behavior or properties of the parts taken separately, and (3) aggregating these explanations into an explanation of the whole. This third step, of course, is synthesis. The figure below models the classical machine age, mechanistic thinking process described by Ackoff. The problem with this antiquated method of yesteryear is that it doesn’t work very well for systems of any appreciable complexity – especially large socio-technical systems (every one of which is mind-boggingly complex). During the decomposition phase, the interactions between the parts that animate the “thing to be explained” are lost in the freakin’ ether. Even more importantly, the external environment in which the “thing to be explained” lives and interacts is nowhere to be found. This is a huge mistake because the containing environment always has a profound effect on the behavior of the system as a whole. 1. 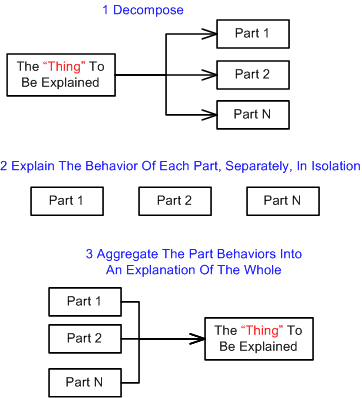 Identify a containing whole (system) of which the thing to be explained is a part. 2. Explain the behavior or properties of the containing whole. 3. 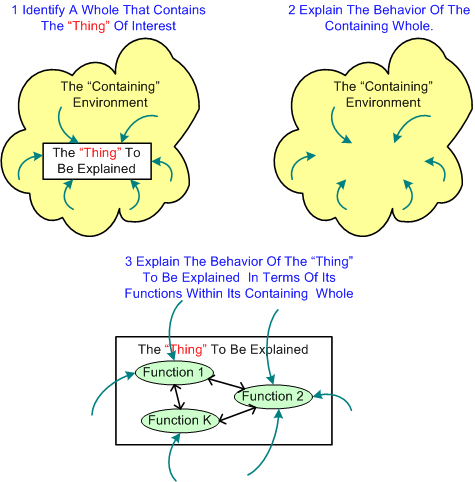 Then explain the behavior or properties of the thing to be explained in terms of its role(s) or function(s) within its containing whole. Note that in this sequence, synthesis precedes analysis. The figure below graphically depicts the systems thinking process. Note that the relationships between the “thing to be explained” and its containing whole are first class citizens in this mode of thinking. One of the primary reasons why we seek to understand systems is so that we can diagnose and solve problems that arise within established systems; or to design new systems to solve problems that need to be controlled or ameliorated. By applying the wrong thinking style to a system problem, the cure often ends up being worse than the disease. D’oh! This tree below is my personal creation. You’re tree would likely be different than my tree. Nature creates perfect trees. Man tends to destroy nature’s trees and to create arbitrary artificial trees to suit his needs. Man must create, either consciously or unconsciously, conceptual trees to make sense of the world. How attached are you to your trees? Are your trees THE right trees and are my trees wrong? Are trees created by ‘experts’ the trees that all should unquestionably embrace? Who are the ‘experts’? Creating the vertical aspect of the tree is called leveling. Creating the horizontal aspect of the tree is called balancing. 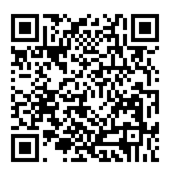 Leveling and balancing, along with scoping and bounding, are powerful systems analysis and synthesis tools. In a man-made hierarchy, each higher level transcends and excludes the lower levels. In a holarchy, each higher level transcends and includes the lower levels. In a holarchy, all entities are unique manifestations of the whole. Thus, full alignment occurs and high performance is achieved. What type of organization do you work for? 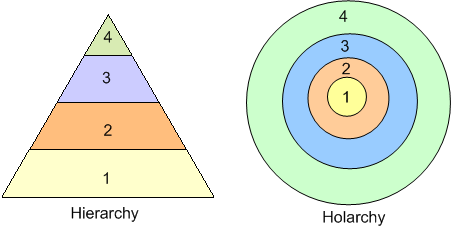 How would one know if he/she is working in a hierarchy or a holarchy?